Since the recent death of Astor Piazzolla, a renown bandoneon player, many well known musicians has began to perform his works again. His music combines the genres of classical, jazz and tango, but goes beyond them to create a new sound, which can be only classified as "Piazzolla Tango." I first encountered Piazzolla's music listening to "Invierno Porteno" (Winter of Buenos Aires) in 1985. The piece has an unforgettable melody that cannot help but move one's heart, thanks to the captivating sound of the bandoneon. The piece began to stir my passion for Buenos Aires, a city I had never visited. Soon after, I was introduced to "Le Grand Tango", a remarkable piece of music written by Piazzolla for cellist Mstislav Rostropovich. 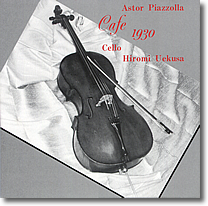 "Cafe 1930" and "Nightclub 1960" are part of a collection by Piazzolla named "History of Tango". They were originally written for flute and guitar "Camorra 3" was one of Piazzolla's last pieces, written in 1989. It theme is based on a fight chant.